In case you missed Hero Arts MMH July 2016 Kit (these kits are like hot cakes!) 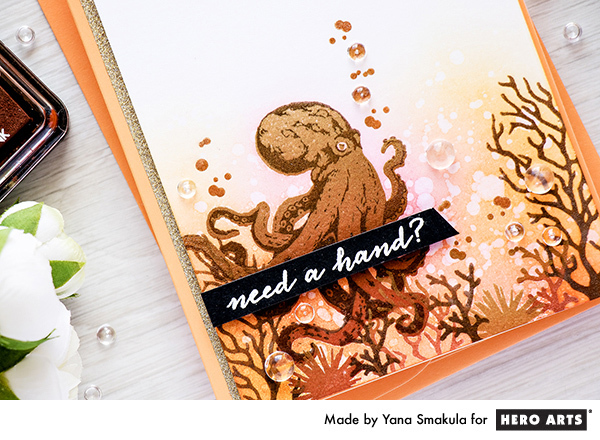 there’s another underwater deep sea type stamp set available that you might like, Color Layering Octopus. This was an add-on set, but you can still pick it up in Hero Arts store, plus there is also has a set of matching dies. I wanted to share one more card I created using My Monthly Hero July 2016 kit and also the Color Layering Octopus stamps. Let me start by saying, these tentacles are just too adorable! 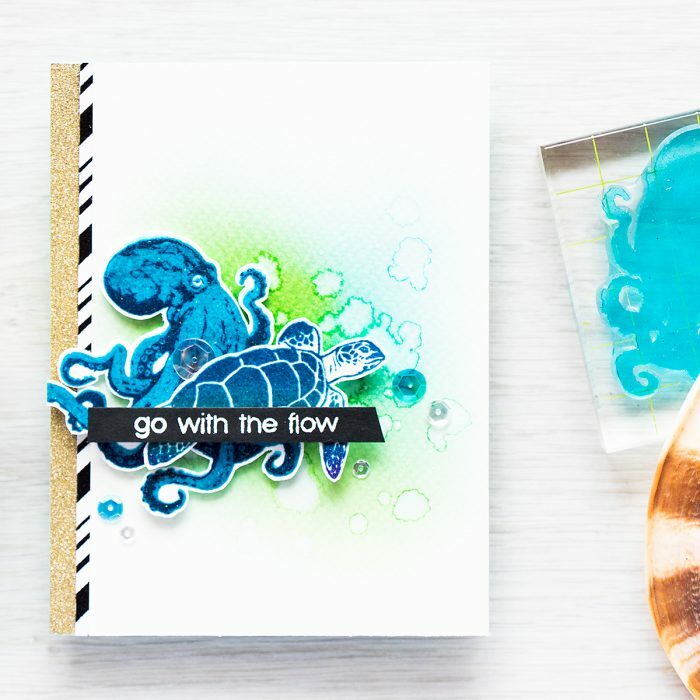 I used two colors of ink (Aquatic and Deep Ocean) to stamp the octopus and also heat embossed this image with Sparkle embossing powder. 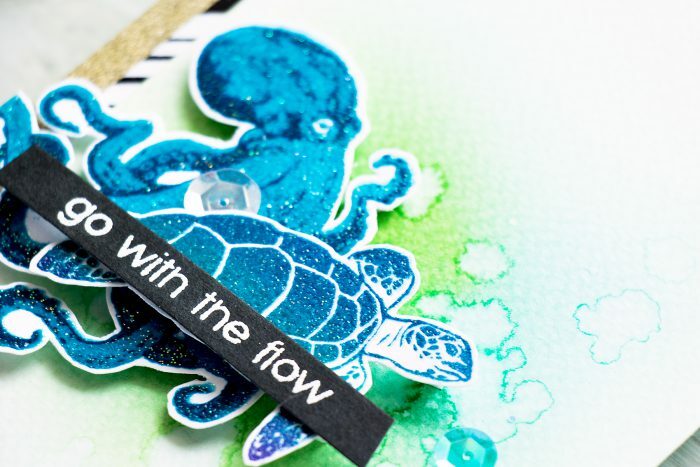 To create a background for this card I used several colors of Distress inks and added large drops of water. My images were foam mounted onto the watercolor panel for a pop of dimension. 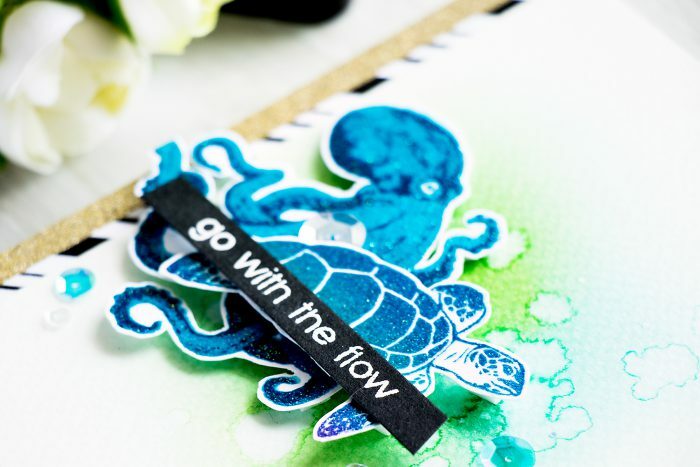 The sentiment, Go With The Flow (I heat embossed it in white) was also foam mounted. To create the black and white stripe to the left I used Candy Stripe background stamp and stamped it in black ink. I also added a strip of gold glitter paper and adhered several sequins to complete this card. 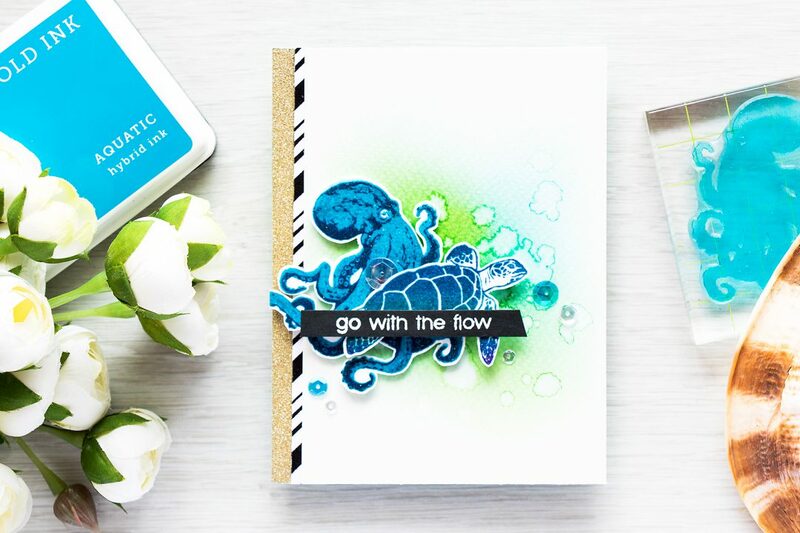 I am sharing one more Octopus card along with a closer look at Hero Arts Pigment Ombre inks on Hero Arts blog. There’s also a video tutorial in that post. Yana, these are gorgeous! I loooove the color combos, the new inks are making my swoon. Thanks for sharing your talents and inspiring. Yana, I absolutely love your creativity. So perfect. Cannot wait this set arrives to me. Was lucky to pick it up while it’s still in stock haha. Your cards are incredible!! The first one stunned me back when the kit was introduced. And today’s one is amazing too! So unusual color combo and incredible design!